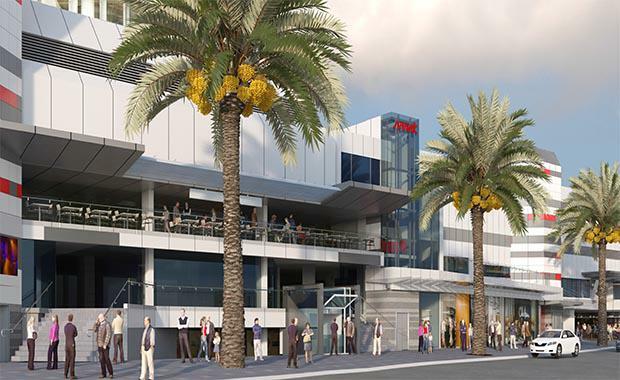 A Surfers Paradise retail precinct has undergone a $15 million refurbishment which is due for completion mid-December, just in time for the holiday trading period. Kym Thrift, Associate Director of Retail Leasing, and Senior Executive Jason Martin from Colliers International are leasing the centre on behalf of Hachma Australia. Miss Thrift said The Mark’s major refurbishment project is the final piece of the puzzle in Surfers Paradise renovations. “The Council’s vision was to have pedestrian access from the Nerang River to the Surfers Paradise beach, with The Mark on Orchid Avenue playing the final part in facilitating the direct access,” Miss Thrift said. Trevor Park, the General Manager of The Mark said the new arcade spans from Orchid Avenue and reconnects into the Soul building. “The car park has also undergone modernisation which incorporates a new car parking system for the 200 bays,” said Mr Park. “The refurbishment includes two new lifts, with one glass encased lift facing Orchid Avenue giving patrons convenient access from the street, through the centre and to the upper car park. “There will be a large format dining opportunity available for lease which encompasses a balcony overlooking Orchid Avenue into the Hilton with an approximate area of 850 square metres. “The lower ground will also have a new tenancy comprising about 1,000 square metres with 10 metre ceilings heights in some areas. This would ideally suit an entertainment based operator who can leverage from the tourist and family based demographics in Surfers Paradise,” said Mr Park. Within the same precinct, Shooters Night Club is due to reopen to the public after a significant $6 million refurbishment. Owner and Managing Director of Shooters, John Hussy, said the layout of the venue is entirely different to what patrons may remember from Shooters in the previous days. “Our venue is doubling in size to over 1,800 square metres, with the quality of the fitout comparable to renowned clubs” said Mr Hussy.